Here We Go…Again « Kathy Murphy, Ph.D.
Our last blog post was in March, 2014. 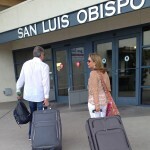 We had just ended our 14 month journey through the US and Canada and finally settled in San Luis Obispo, California. After all that traveling around from place to place, we have loved having our own bed every night and our daily routines. We love our new community and our new friends. Already we’ve grown quite comfortable in our somewhat predictable lives. But, for some reason, we seem to not be able to sit still for long. The title of that last blog was “Is the Journey Ever Over?” And, of course, the answer is never. The time has come for yet another adventure. This trip won’t be a year in our SUV, this time we are going on a six-week spiritual pilgrimage to Bali and India. And just like on our last adventure, we invite you to travel along with us. We intend to share with those of you at home (still in your comfortable beds) our adventures as we travel by planes, trains, and automobiles around Bali and India. Part of the joy of the journey is sharing it with others. Won’t you come along? Note: This is not a tourist trip or a vacation. This is a spiritual pilgrimage. This journey is for the purpose of deep personal growth via visiting and learning about great sacred and spiritual sites. Throughout most of our journey we will be traveling with Atum O’Kane, a spiritual teacher who leads pilgrimages throughout the world. 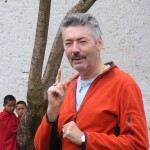 Atum holds a doctorate in Transpersonal Psychology and has focused his work on the depth psychology of Carl Jung. He is a senior teacher in the Sufi Order International where he served as the Secretary General for twelve years and he has co-taught with Zen Buddhist teachers in an interfaith dialog for over ten years. He was mentored by Reb Zalman Schachter, founder of the Spiritual Eldering Institute. On this pilgrimage, under Atum’s guidance, we will first visit the enchanted island of Bali. Not only will we see some of the beautiful temples of this Hindu country, we will also closely and reverently observe the daily practices of the people of this deeply spiritual land. In each of these sacred places, we will participate in meditations, teachings, spiritual practices, and creative exercises designed to deepen and enrich the experience. So you see, a grand journey awaits. And it’s not just a journey to a distant land, it’s a journey to find the sacred – a journey to find the soul of a land, of a people, and maybe even our own. Yesterday we arrived in Bali. The trip was difficult. A one hour flight to LAX, a fifteen hour flight to Hong Kong, a five hour flight to Dempensar, Bali, and a two hour car ride to Ubud where we will be staying for the next two weeks. I already dread the return flight to SLO. However, the arduous journey was worth it. Bali is magical. We actually aren’t staying in Ubud. Though a wonderful city, it is bustling and crowded with tourist and tourist prices. 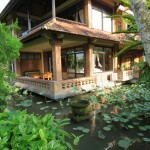 Instead we are staying at the Melati Cottages in Penestanan in the Ubud district. It’s an exhilarating 20 minute walk into Ubud. At first glance, it feels dangerous with the narrow roads, many cars and scooters, and no sidewalks. But after awhile, you begin to notice there is a rhythm to the chaos. It all just seems to work. 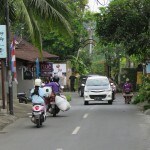 This area feels a bit more authentic and charming than downtown Ubud. I am having reverse sticker shock here. Imagine this: A 90 minute massage costs $12 US dollars (including tip). Our cottage including breakfast is $40 US dollars per day. Our evening meals have been averaging about $10 for the two of us. And local clothing and jewelry are just a few dollars. One could get carried away with all the shopping and the dining. But that’s not why we’re here. This is a pilgrimage. Tomorrow we begin our journey into the sacred. Along with about twenty other pilgrims, we will start a 12 day immersion into the soul and the spirit of Bali. This adventure promises to be quite meaningful and beautiful. Look for our future blog posts. We will share pictures, experiences, teachings and personal insights. We hope you enjoy what we share and we would love to hear back from you in the comments below. This entry was posted on Sunday, March 1st, 2015 and is filed under Spiritual Journey, Travel blog, Uncategorized. I am loving your adventures and living vicariously through your travel log! Sending you many good blessings on this adventure … and looking forward to the stories! Sounds like an amazing journey! India was amazing & can only imagine Bali being incredible! Safe travels and live and hugs from C-town! Am so grateful to be included in this blog post. Jon & I spent a month in Bali in 2013. We got scuba certified, visited temples, & loved the rhythm, spirituality, & heart & soul of the people. I’m so looking forward to joining you & Atum in India in just 2 weeks. Many blessings on your journey! Oh so excited to see that you will be sharing your experience with us through your blog. And I am envious of a $12 massage but well deserved after your long travels. Thanks for including me on your blog so I can follow along on your journey. All the best and looking forward to your stories. Thanks for including me in your travels. I was just thinking (with my heart) about you both!! What a wonderful adventure to embark on. Love that you two are going on this journey together…I’m reading “Walking Home” by Sonia Choquette, a memoir about her own pilgramage on the El Camino. Peaceful wishes and heart openings for you and Michael on your journey. What a treat to enjoy your trip with you! Thanks!! Wow..so happy for you both my dear heartfriends . Really excited about joining you in spirit. Thank you for including me…Can’t wait for more. be safe and enjoy all that is given. Oh, so looking forward to you pilgrimage, pictures, experience!! Thank you so much for sharing this wonderful, most auspicious trip! It is good to hear from you again, and to hear of your adventure. I so look forward to hearing about the pilgrimage, as I travel along with you in spirit. Be safe. Blessings to the both of you. Thank you so much for including me! I am thrilled with this news and wish you peace and beauty. Sounds more comfy than where we met! 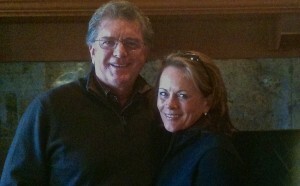 Kathy, I’ve been thinking about you lately, and hoped we would meet up at the Womens’ Symposium. I’m very excited for you and look forward to hearing more as you journey further. Many blessings. Dear Kathy and Michael, I look forward to journeying with you again. I know it will provide a pilgrimage for me through your eyes, your heart and your writing. Thanks for inviting me to journey with you…again. What a TREAT to see this message and invitation from you today! I totally lost you the last time you traveled–had a busy year of my own at that time–good–but busy! Hopefully, since I am RETIRED, I can keep up with you on this adventure! Love you and would love to see you sometime–any chance of traveling to South Carolina again in this lifetime?? I met Kathy and Michael on their first journey. Now I have made a true friend and can live this trip vicariously through her (Kathy but also Michael). It will be great to have her share this experience and maybe some insights. Travel safe…….aloha! all of our travels . I think of you often and wish you well. Looking forward to hearing more about your experiences! What a blessing that you can take these trips in your life. Namaste! This is an area of the world that I will never be able to visit and I love seeing and hearing about your journey. Take all your worries and send them somewhere else where they can worry about themselves!